This is a godly gun. All trades will be recorded asproof of receiving the item you paid for. FINAL FANTASY MASTER ARMS. 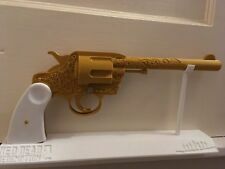 Collectable replica gun with stand, from FF VII. Official Fallout 76 product. Based on the iconic Vault Boy. Made from highly durable PVC plastic. This is an official Ubisoft promo item. 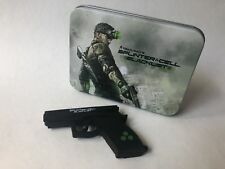 Splinter Cell Blacklist 4GB Gun USB Stick. Volcanic Pistol from the Red Dead Redemption series. Printed using PLA, 0.1mm layer height. Length: 35cm. Gal Gun: Double Peace - The Art of Gal Gun Artbook - Rare Collectible. 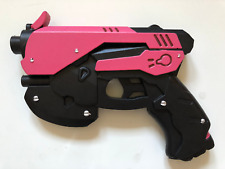 Overwatch D.va Replica Foam Pistol Gun Prop Cosplay. Perfect for Cosplay, Fancy dress, Display etc. Construction: EVA Foam. Like what you see so far?. No problem. We're Rated Excellent See our. Top Categories. Used for adults/ teens,female/male, Size: 21cm length. 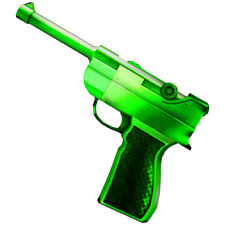 We have shrunk and slightly modified the original ray gun design for the New 15" Ray Gun. 【Launch direction】 Front and rear (pump type). Two water guns entered. You need to get an import permit from Ministry of International Trade and Industry tog get your item if your item is more than 1000 MXN. | You can use it replaces the left and right of the lever. | Body size: 375 × 135 × 70mm | Age: 12 years of age or older. [ Release Date(yyyy/mm/dd) ]. the manufacturer will change contents, date and quantity for sale. Gears of War Gun Keyring Set. Condition is New. This item is new, some sticker glue on lid but should clean off with no problem. Dispatched with Royal Mail Signed For® 2nd Class. Graphik Webfont", Arial, Helvetica, sans-serif; background-color: rgb(255, 255, 255);">This is the second gun from Destiny 2 that im making and i think its one of the best or maybe even the coolest one in Destiny 2. This gun is kinda big with a 42cm x 21cm x 7.5cm. This is not made in a factory, its handmade by a person and this things do happen. Fortinite Tactical Shotgun. File by: Jonathan Mason @ Chronos Creations. Around 80 cm´s long. No moveable parts. Hand painted. Full Size, fully finished ready product. Item is untested, we've listed this as "for parts or not working" as we have no facility to test the item. Fortnite Minigun replica Toy Cosplay Prop. Condition is New. Full size, fully finished perfect for Cosplay, large display, general play and more. Liquid error: Index was out of range. Must be non-negative and less than the size of the collection. We will always do our best to help you in anyway we can. HOW DOES IT WORK?. MY ITEM IS NOT AS DESCRIBED. The art of gal gun rare promo art book, new. This unit is new and unused. This is the full-size, 1st run Limited Edition. Splatoon Spline Shooter Orange Water Gun. We are located in Japan a suburban city of kyoto. Our Products are 100% Authentic. Metal Gear Solid 4 - ‘Guns Of The Patriots’ -Tactical Espionage Action Book. Condition is New. Dispatched with Royal Mail 1st Class Large Letter. Fallout - Vaultboy of the Month - Limited Edition Tee shirt - Gun Nut. 'Gun Nut' is aFallout 3 andFallout 4 perk. The Vault Boy of the Month Limited Edition Tee shirt. Official NECA Full-Size Aperture Science P-Body Portal Gun Replica. Gun in great condition with battery included. 1 of 5000 guns produced by NECA. Exact full size replica of the DVA gun and headset from Overwatch. Perfect for a Cosplay starter set, display, general play and more.